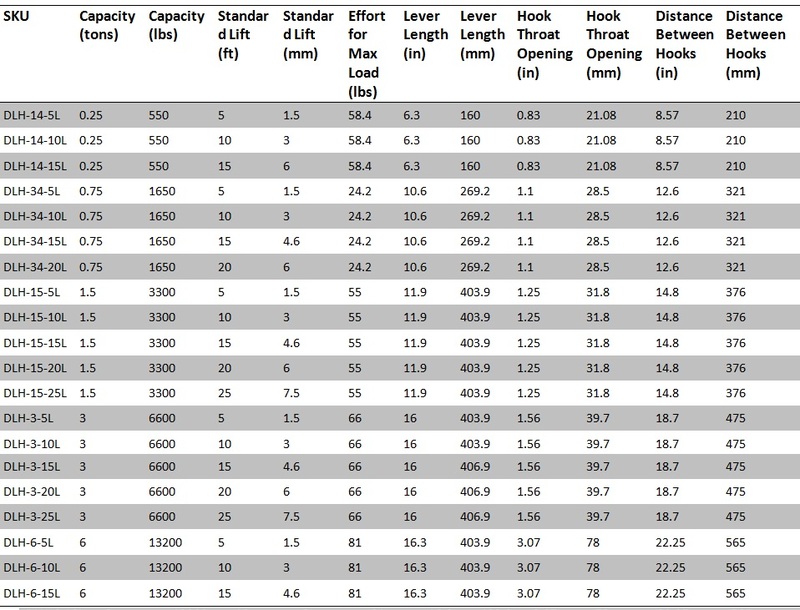 • Hook Throat Opening: 1.25"
• Minimum Distance between Hooks: 14.8"
Minimum Distance between Hooks: 14.8"
Meets: ANSI/ ASME B30.21 & B30.10 design performance testing standard - OSHA complaint. Grade 80 alloy hoist chain. Impact resistant steel casing, gear & frame Meets: ASME B30.21/HST-3M design performance testing standard. Alloy steel forged hooks designed to bend slowly as a warning sign in the event of overload. 360 degree swivel-rotation on top hooks, bottom hooks and handle. High strength steel stamped cold-formed casing, frame and lever handle. Positive load control & brake action - Weston style load brake, 4 braking surfaces, 2 moisture resistant brake pads, double brake pawl system - fully enclosed (except 1/4 ton unit). Powder coated finish to assist against potential corrosion. Individual serial number and test certificate issued for operational testing to 150% of rated capacity. 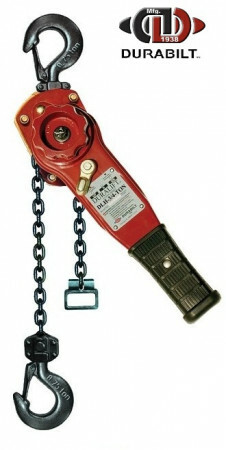 All hoists have "free-chaining" feature for quick slack take-up. Load chain roller-guide system for efficient multi-position lifting, pulling, stretching & positioning.